Dear readers, today we are going to discuss the most favorite apparel that Indian woman love to wear. Yes, it is none other than our beautiful Indian saree. A beautiful smile is assured on a women’s face when you gift her, a saree. This is simply for the love that Indian women have for sarees. The love and interest in sarees never fade even if many other varieties of clothing come to the market. Some people say that they are more comfortable and feel complete when they wear a saree. There are many varieties of sarees and they are distributed according to every region. A Kanchivaram saree is popular in South, a Banarasi saree is famous in North, a Mekhela Chador is famous in the North East; every state has their special creation of saree. I think imost women now know how to save on their saree shopping. We have few other tips on how to save money on online shopping of sarees. Shopping with IndiaRush, will be a smart shopping experience. We all know that online shopping saves us a lot of money, but we do not want to compromise on the quality or color that the saree has. 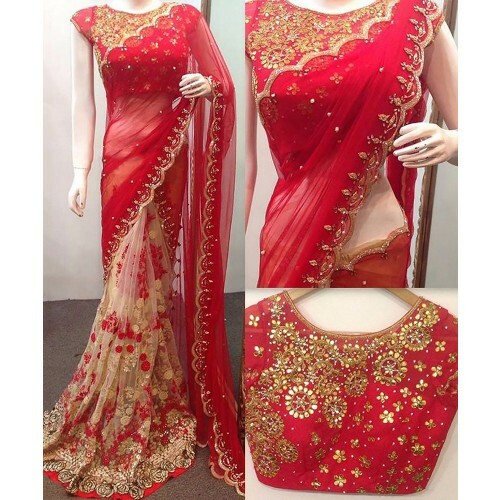 IndiaRush is a beautiful site where you can buy some real good sarees at a price that is truly reasonable. Moreover, there are many coupons and deals sites which offer amazing discounts on IndiaRush products, one of which is Dealozo offers and coupons. IndiaRush has a huge collection of sarees including the latest trending designs. Several varieties including the silk, cotton, plain georgette sarees, crepe silk sarees etc. can be found listed on IndiaRush. Images of the saree, as well as the price, are given below every saree, and also a quality assurance seal is being put on the image. IndiaRush is a popular website for ethnic wear and the website also offers some of the coolest sarees at a decent price. There are many beautiful poly silk sarees which are blended with zari and embroidery. The collection of sarees from IndiaRush include designer sarees with bright colors and stone work. If you are in search of some cool cotton with good prints and colors, you can buy them from the IndiaRush online store. In spite of already selling them at an affordable price, IndiaRush also offers great discounts on their products. This poly silk beautiful saree is priced at only Rs.1000. Just the color and the quality of the saree is so good that other sites can definitely sell this upto Rs. 2500. This is one variety, and also there is an exclusive section that contains the list of sarees that is popular among celebrities. This bright colored designer saree cost Rs. 2166, while other site may generally sell the same saree at a price at Rs. 5000 or even more. I recommend you go through their collection thoroughly before making a purchase from other stores be it online or offline. The price of this saree is only Rs. 1699 rupees which is again much less than the retail stores. The reviews clearly says that it is a worth buying at this price. The above image shows sarees that iare inspired by celebrities style, and come in a price range that is not too expensive. This one is priced at Rs. 1680. Below image is a saree that is being worn by Rakul Preet and it is a beautiful crepe saree priced at just Rs. 654. This small article will definitely give you an idea about what IndiaRush website is all about and you will realize that buying from this website can save you a lot more. Enjoy the beauty of every saree and also be proud that you got it at a much lower price without compromising on quality. P.S. This is a Guest Post. wow...these elegant saris looks beautiful on them. I wish I could wear one like this for any party. I once bought a watch for my cousin from IndiaRush. They were good. Good service. It is impossible to describe how beautiful theses sarees are. Wish to have a saree like that red one.